A 60% decrease in fire deaths in both California and the United States as a whole since 1980 parallels the decrease in per capita cigarette consumption, increased enforcement of improved building, fire, and electrical codes; and the increased use of smoke detectors and sprinklers. 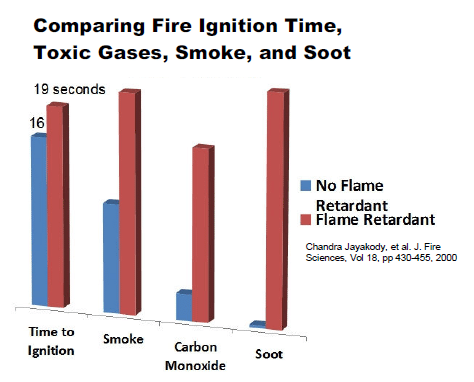 While flame retardants may reduce the time for a material to ignite by a few seconds, they increase the carbon monoxide, toxic gases, smoke and soot produced once the fire begins, threatening both fire victims and firefighters. Most fire deaths and most fire injuries result from inhalation of these gases and soot. When the flame retardants themselves eventually burn, they can produce highly toxic, bioaccumulative, and persistent dioxins and furans. 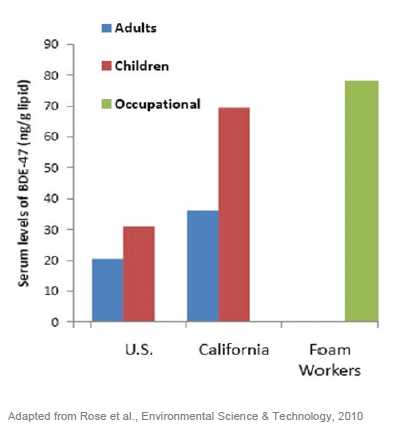 Flame retardant levels in California children aged 2-5 years are similar to levels in occupationally exposed adults in the foam industry. 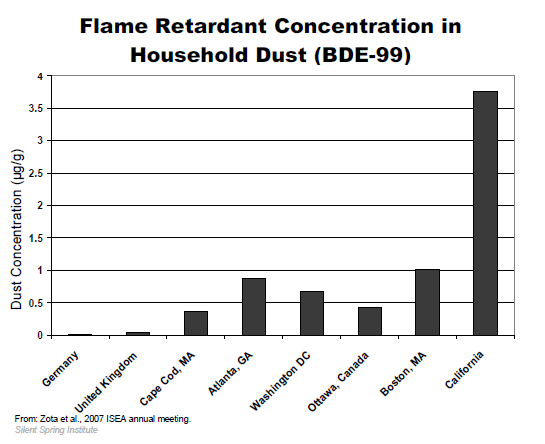 Flame retardants pose a serious hazard to pregnant women and young children who are the most vulnerable to endocrine disruptors, carcinogens, mutagens, and neurological and reproductive toxins. endocrine and thyroid disruption 9, 10and other health conditions. Firefighters have significantly elevated rates of four types of cancer: multiple myeloma, non-Hodgkin’s lymphoma, prostate, and testicular cancer.11These elevated cancer rates may result from exposure to dioxins and furans, which are formed when flame retardants burn. Provide industry with incentives to create affordable and less toxic products. 3 Grandjean P and Landrigan PJ. (2006). Developmental Neurotoxicity of Industrial Chemicals. The Lancet. 368; Schantz S et al. (2003). Effects of PCB Exposure on Neuropsychological Function in Children. Environmental Health Perspectives. 111(3): 357-576. 6 Main, KM, Kiviranta, H, Virtanen, HE, Sundqvist, E, et al. 2007, “Flame retardants in placenta and breast milk and cryptorchidism in newborn boys.” Environmental health perspectives, vol. 115, no. 10, pp. 1519-26. 7 Akutsu, K, Takatori, S, Nozawa, S, Yoshiike, M, et al. 2008, “Polybrominated diphenyl ethers in human serum and sperm quality.” Bulletin of environmental contamination and toxicology, vol. 80, no. 4, pp. 345-50. 8 Harley, KG, Marks, AR, Chevrier, J, Bradman, A, et al. 2010, “PBDE concentrations in women’s serum and fecundability.” Environmental health perspectives, vol. 118, no. 5, pp. 699-704.